Preserve your own voice as synthetic speech. 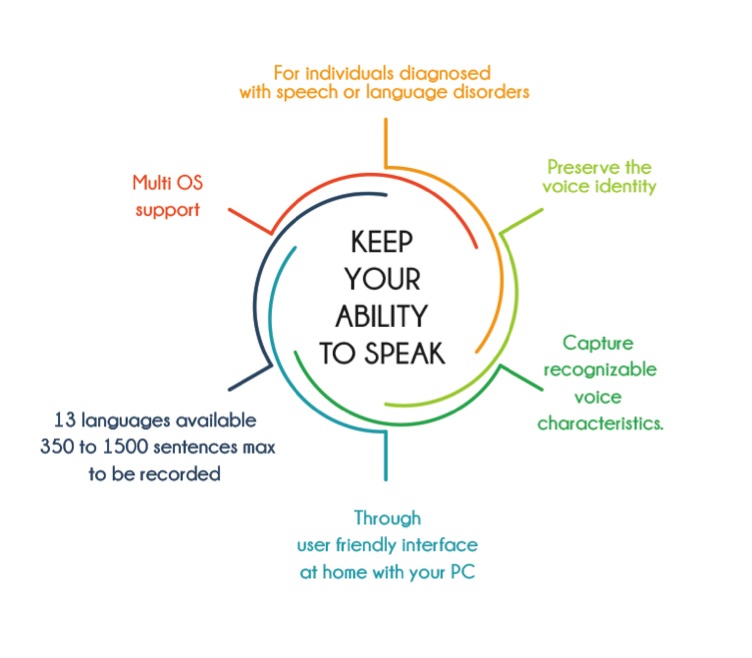 For individuals diagnosed with speech or language disorders – resulting from ALS or other conditions such as aphasia, dysarthria or apraxia – capturing the essence of their voice before losing it is a crucial step in preserving their identity. ‘My-own-voice’ offers end users the possibility to keep speaking and communicating, not only by using speech synthesis as a voice companion, but also by using their own voice, synthetically re-created, helping to fully maintain the user’s identity. ‘My-own-voice’ can already be performed in up to 13 languages and new languages will regularly be added. ‘My-own-voice’ creates a synthetic voice, very much like the user’s own, that can be employed with an assistive device to read any sentence, keeping the essence of the original voice in terms of timbre, accent and intonation. For individuals who have already lost their voice, they can ask a family member, a close relative or a friend, to donate their voice, offering the end user the possibility to speak with a voice that sounds familiar and unique. Meet Eric, Garmt and Peter, pioneers of ‘my-own-voice’. 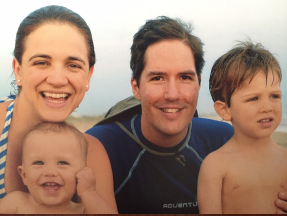 Eric was diagnosed with ALS several years ago. He decided to create his own synthetic voice and agreed to participate in the first ‘my-own-voice’ trials. Garmt received the same diagnosis and also agreed to help us out. He is sadly no longer with us. They both helped turn the ‘my-own-voice’ concept into a real solution for many people. We learned a lot from them and would like to thank Eric, Garmt, their families and friends. « Since the day I was diagnosed with ALS (Amyotrophic lateral sclerosis) disease 2 years ago, my brother Josh and I learned my voice would be rapidly declining and very soon I would be unable to speak. This would frighten anyone, but I have always been a man of many words so it was incredibly crushing to me. My brother took action and we focused on finding the best synthetic voice out there that could replicate my voice so I could ‘hear’ myself again. After trying multiple companies, we quickly learned that Acapela Group was by far the most realistic and most technologically advanced. Unfortunately, by that point, I was unable to complete the clear speaking hours necessary to create my own voice. I was depressed again. To learn more about Eric and his daily fight against ALS, visit his website ‘Fight like a champion’. « The voice from Acapela is an important part of me. No, that is not a grammatical error. My voice is a part of who I am, part of my identity. ALS took that away quite fast. Within months, the synthetic voice sounded more like myself than I did. The first few samples that I played for my friends convinced me that the time investment was worth it, as they honestly thought I was speaking myself instead of artificially. Now, I use it almost exclusively to communicate. I am being taken apart by this disease but this part of me is safe. Acapela supported me in an exemplary fashion, answering every question and offering advice and support where needed. I got to know them as a trustworthy, friendly and professional company. Garmt left us on October 23rd, 2017. After his diagnosis Garmt told the world that ALS would be sorry for choosing him. He would ‘kick ALS in the balls’. And he did. In 2013 together with Bernard Muller and Robbert Jan Stuit, he launched Project MinE, the groundbreaking genetic ALS research. This was just one of his initiatives to beat ALS. His energy was immense. And he shared his thoughts through his blogs and his book ‘ALS dan toch‘. We are thankful for his contribution and we will miss him. Peter records voice when cancer threatens to take it away. Peter was diagnosed with cancer in 2015. When he learned he needed surgery to remove his tongue and possibly his vocal cords, he took proactive steps to ensure that he would not lose his ability to communicate. He recorded his voice with ‘my-own-voice’ in 3 languages. Born in Mexico to a German father and Mexican mother, Peter speaks German, Spanish and English. He lives in Mexico with his wife Ana and two young children and enjoys helping the kids with their education. At work, he is a business development director at a holding company of one of the largest microfinance banks in Mexico. The company has been very supportive and has given Peter the time off needed to cope with his treatment and recovery. The surgery required removal of Peter’s tongue but fortunately not his vocal cords. This meant he would still be able to speak, but not be completely understandable. So, prior to having the surgery, Peter got in touch with us to use ‘my-own-voice’. Using the ‘my-own-voice’ service, he captured his voice in all three of the languages he speaks: German, Spanish and English’. Peter uses the voices with Proloquo4Text, so he can easily type anything he wants to say and then speak the text in his own voice. 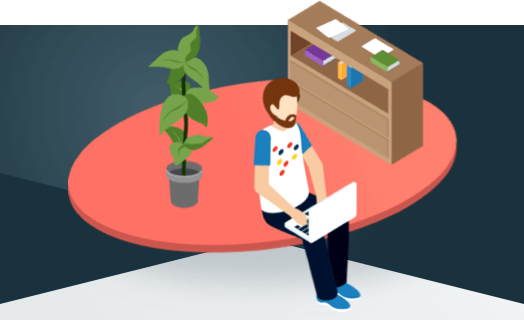 It is the perfect fit for Peter because of its support for multilingual users.